Oh my the summer holidays really got in the way of my blogging time, I'm so sorry for my sudden disappearance. It's been a few weeks since my last pregnancy update now, obviously she didn't arrive in August as I had hoped! But things are going pretty well. There have been a few unexpected hospital visits, another scan and much talk about induction. Fortunately all these extra visits and tests have reassured me that she is quite happy in there and growing well, maybe a little too well. At my last scan at 37 weeks she was estimated to weigh 7lb 4oz already with a head that measures 34cm! I'm hoping this are generous estimates. She also has really high water levels, which although can indicate various problems, the doctors seem reasonably OK with, though I have been warned to get a plastic sheet for my bed in case my waters decide to break in my sleep. I'm now terrified every time I leave the house that I'm going to have movie style water breakage in the middle of the street or supermarket etc... regardless of the myths of free stuff from the location of water breakage, I'm not sure it would be worth the embarrassment. I've been getting labour type pains for over a week now, every so often they become quite intense and with some kind of regularity tricking me into thinking this could be it, I go to bed every night quietly convinced, tonight will be the night, but wake up to nothing but swollen feet and hands! I didn't go into labour naturally with Milo as I had an emergency induction and don't remember any of these baby mind games from the last few weeks of that pregnancy. The waiting is driving me mad! I'd love for her to hurry up and decide to arrive of her own accord. 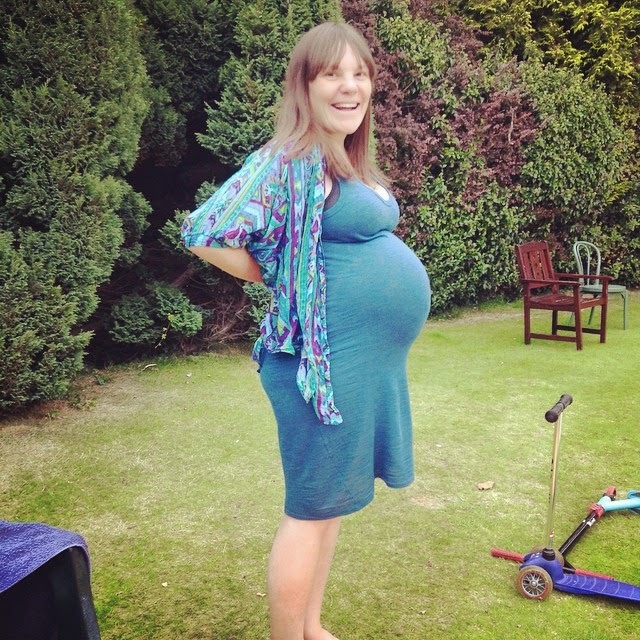 After much negotiation the consultant has agreed to wait until my due date for induction, I'd love to avoid this. I'm still hopeful I might be able to deliver in the birth unit rather than the delivery suite, which will only happen if things all go well and naturally. Not to mention that most of the induction stories I have read seem to last for days and end in emergency Caesarean section. This definitely wasn't the case for me last time, but I think I was just really lucky with how things went with Milo, I guess I just have to wait and see. Hoping this might be my last pregnancy update, but if not there will only be one more that much I do know, as the day I hit 40 weeks I will be having the baby one or another! Cannot wait for her to arrive now.